A heatwave that has left Italy sweltering in record temperatures sparked wildfires Thursday which claimed the life of one elderly woman and forced the closure of a major highway. The 79-year-old woman was found dead in a field next to her home in Sant'Omero in the central region of Abruzzo, having apparently been overcome by flames that engulfed two hectares of surrounding farmland. 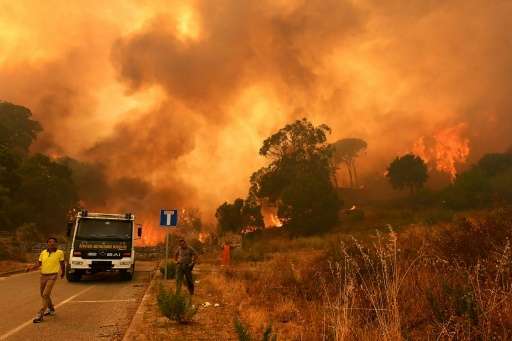 A section of the Via Aurelia coastal motorway that runs northwards from Rome to the Riviera had to be closed for several hours because of a major fire near Grosseto in Tuscany. The region's celebrated landscape is usually baked to a rich golden colour by the end of the summer: this year it resembles burnt toast with August barely underway. With peak temperatures topping 40 degrees Celsius (104 degrees Fahrenheit) in much of the country, a total of 26 major towns and cities were on the health ministry's maximum heat alert. Admissions to hospital emergency units have spiked 15 percent in recent days and forecasters see no respite coming before early next week. High humidity in the north and hot winds from Africa in the south are making the perceived temperatures seem even hotter for Italians longing for the beach. The heatwave has come on the back of a prolonged drought that is set to cost Italy's large agricultural sector billions with 11 regions facing critical water shortages. Olive yields in parts of the country are forecast to be 50 percent lower than normal this autumn and the scarcity of water has cut sheep's milk production by 30 percent in others, with knock-on effects for the production of one of Italy's most popular cheeses, pecorino.